Puzzle #147: The “Aha” IBM Puzzle! Sometimes I worry whether I will continue to get good puzzles for children, but every such time one comes across some beautiful puzzle! I came across one such yesterday in Martin Gardner’s book “The Colossal Book of Short Problems and Puzzles”. 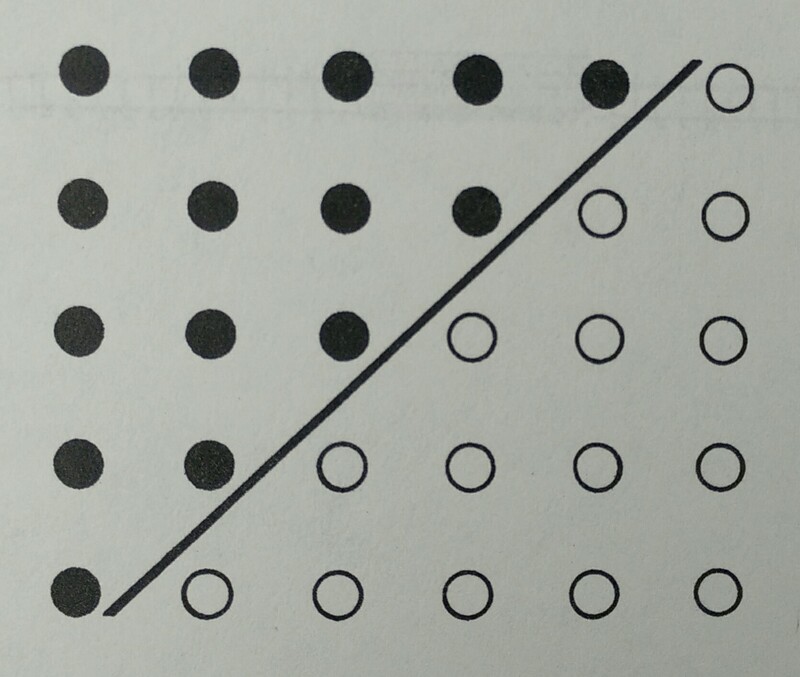 Draw a 5 x 6 array of spots on a sheet of paper, then rule a line as is shown in the figure above to divide the array into two triangular halves of 15 spots each. On the spots above the line (shown in black), place 15 pennies or any other object. The task is to move all the pennies from above the line to the spots below the line. Each move is a jump of one counter over an adjacent counter to an unoccupied spot immediately beyond it on the other side. Jumps may be to the left or the right and up or down, but not diagonal. For example, as a first move the penny at the fourth spot on the top row may jump to the top far right white spot or it may jump down to the third spot from the top in its column. All the jumps are like the jumps in checkers except that they are confined to horizontal and vertical directions and the jumped pieces are not removed. Can the task be done at all? If a penny is removed from a black spot, can the remaining 14 pennies that remain be jumped to white spots? If two pennies are removed, can the task be done? The problem is originally attributable to Mark Wegman of the T J Watson Research Center of IBM Corporation. It is a very interesting puzzle as the puzzle does not require any complex concept, and the trick is within the grasp of a 10 year old. This entry was posted in Puzzles and tagged Alok Goyal, Chess Problems, logic puzzles. Bookmark the permalink. 1 Response to Puzzle #147: The “Aha” IBM Puzzle! Note that all unit operations either increase or decrease x and y co-ordinate (with the top left most point being 1,1 and positive axes down and right) by 2 exactly. To satisfy the invariance that number of even points cannot change – in all the three cases – shift cannot happen.